GW441756 is a potent, selective inhibitor of TrkA with IC50 of 2 nM, with very little activity to c-Raf1 and CDK2. Effect of TrkA inhibitorGW441756 on vorinostat andNGFmediated ERK phosphorylation. A)NS-1 cellswere treatedwith vorinostat (1 and 2.5 μM) andNGF (2.5 ng/mL)with and without GW441756 (1 μM) for 3 h. The blots were probed with anti-pERK.1/2 antibody. Vorinostat mediated activation of ERK1/2 phosphorylation (pErk) was abolished in presence of GW441756. 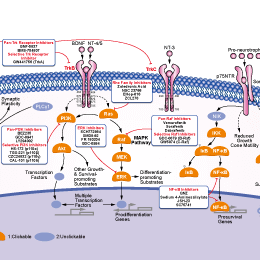 Total ERK levels were checked using ERK 1/2 antibody. B) Bar graph represents the densitometric analysis of immunoblots. X axis represents treatments and Y axis represents the ratio of absolute relative density of pERK to the total ERK. The data sets are the mean ± SE of two biological replicates from two independent experiments (values compared to control vs vorinostat 1 μM and 2.5 μM, vorinostat 1 μM and 2.5 μM Vs GW441756 + vorinostat 1 and 2.5 μM respectively). *P < 0.05, **P < 0.001, ***P < 0.0001 indicate significant differences and ns indicates non-significant difference. GNF-5837 is a selective, and orally bioavailable pan-TRK inhibitor for TrkA, and TrkB with IC50 of 8 nM, and 12 nM, respectively. PF-06273340 is a highly potent, kinases elective, well-tolerated pan-Trk inhibitor with IC50 values of 6, 4, 3 nM for TrkA, TrkB, Trk C, respectively. Quantification of colony formation in (A), shown as a percentage of the control for NCIH2077 and RT112. Mean (3 biological replicates) +/- standard deviation (SD) shown (* p-value < 0.05, ** < 0.005, *** < 0.0005, two-sided t-test, comparing combination treatment to BGJ398 treatment). ns = not significant. (BGJ, BGJ398; Tram, Trametinib; BKM, BKM120; AZD, 8931; LDC, LDC1267; LOXO, LOXO-101; Imat, Imatinib; MGCD, MGCG-265). ANA-12 is a selective TrkB antagonist with Kd of 10 nM and 12 μM for the high and low affinity sites, respectively. Maternal exercise ameliorated sevoflurane-induced neuronal cell loss and decreased dendritic spine density, blocked by TrkB inhibition. Nissl staining and Golgi staining were performed after behavior tests (n = 3). (A) Nissl staining in the CA1 region of hippocampus under ×400. (B) Neuronal density ratio changes. (C) Golgi staining in the CA1 of hippocampus under ×1000. (D) Histograms represented the number of dendritic spines/10 μm. Values are mean ± S.E.M. *p < 0.05, compared with Ctrl group; **p < 0.01, compared with Ctrl group; ##p < 0.01, compared with Sevo group; ∧∧p < 0.01, compared with Sevo + ME group. One-way analysis of variance followed by Tukey post hoc multiple comparison tests was used for data analysis. 7,8-Dihydroxyflavone acts as a potent and selective small-molecule agonist of the TrkB receptor (Kd ≈ 320 nM), the main signaling receptor of brain-derived neurotrophic factor (BDNF).